Joel and Lauren Jackson were married in 2013 and did a second "first dance" two years later when Joel was able to stand for the first time after a car accident, ABC News reports. The wife of a Florida man who was paralyzed from the neck down in a near-fatal car crash said it was pure "magic" when she was able to dance with him to their wedding song this month. That was the first time her husband was able to stand in six years. The YouTube video of the couple dancing has drawn more than 300,000 views. Since the dance earlier this month, Joel Jackson, 26, has taken steps using a walker and continues to make significant progress, according to his wife, who shared a new video of Jackson walking with ABC News. "For him to be able to regain this much movement in such a short amount of time, there's no stopping him at this point," Jackson's wife, Lauren, told ABC News. Lauren Jackson, also 26, says she was texting her sister on her phone while her husband, Joel, was at a physical therapy appointment on Oct. 1, when she looked up and saw her husband, Joel, standing. "I was like, 'Oh, we are doing that today,'" Lauren, 26, told ABC News of her shock. Joel suffered a C-1 injury, usually a deadly injury, when he was a passenger in a car that crashed in 2009. The couple, who have known each other since they were 14, dated but broke up when they were still teenagers. The two were reunited after Lauren heard about Joel's near fatal injuries and rushed to the bedside of her ex-boyfriend. Lauren said she stayed by his side during his recovery, and the pair were married in 2013. At their wedding, held in a barn and attended by 250 guests, Lauren sat on her husband's lap for their wedding dance to Edwin McCain's "All Be." 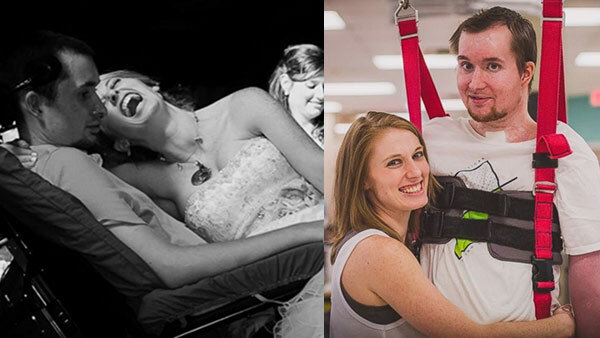 Joel and Lauren Jackson were married in 2013 and did a second "first dance" two years later when Joel was able to stand for the first time after a car accident.